There is a growing need to provide adequate treatment for individuals that have been incarcerated and who are struggling with addiction. Reports indicate that around 45% of individuals in jail are dependent upon addictive substances (Bureau of Justice), and a higher percentage of inmates (~65%) are substance abusers (Bureau of Justice, CASA Columbia). This is in stark contrast to the percentage of people in the general population who are dependent, which is around 10%. 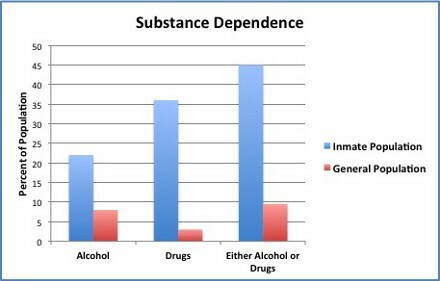 Substance dependence in the inmate population vs the general population. Rates are much higher in the inmate population. Inmates with substance dependence are almost two times more likely to re-offend than non-drug dependent inmates. Additionally, the cost of committing these individuals is much higher than simply attempting to treat individuals, provided treatment helps to deter recidivism. One report estimated that $74 billion is spent on incarceration costs, and less than 1% of this is spent on treatment, which means that treatment for substance dependence remains largely unavailable, with just over 10% of inmates having access to treatment. This same report found that if funding was increased to provide treatment for all substance-dependent inmates, and if roughly 10% of those individuals benefited from treatment and did not re-offend, investment in treatment would break even in the first year. In subsequent years, investment would see about a $90,000 return. The argument for treatment is partially supported by the fact that drug-dependent individuals, as noted above, are almost twice as likely to re-offend multiple times compared to non-dependent individuals. However, the problem is more complex, because 63% of substance-dependent inmates have received some form of treatment for drug addiction previously. Overall, this means that treatment is rarely available, but even when it is available, it remains largely ineffective. Rankings of treatment type’s effectiveness. While 12-step programs are the most widely used addiction treatment, they rank very low for effectiveness. Part of the issue may be the type of addiction treatment most used by individuals. By far the most widely available and most used treatment for addiction is participation in a 12-step program (used by over 2 million people). While it is difficult to determine treatment effectiveness, William R. Miller, in the Handbook of Alcoholism Treatment Approaches: Effective Alternatives, ranked 12-step programs at 37th, while other treatment approaches, such as motivational interviewing, community reinforcement approach, contingency management, and certain medications were included in among the top 10 most effective treatments for alcohol dependence. While in prison, inmates have access to a few types of addiction treatment, such as cognitive behavioral therapy (CBT) and/or 12-step facilitation, but, as noted, access is limited, and some studies have shown no difference in effectiveness comparing CBT and 12-step programs. In other words, 12-step facilitation and CBT are equally effective but marginally so compared to other treatment types. Another issue is how addiction is perceived, and subsequently how addiction should be treated. There’s debate as to the underlying reasons for addiction, and it appears that there will be no reconciliation any time soon. The debate may be critical in the long term as to understanding the primary reasons for addiction, but it may serve as a distraction in the meantime. Perhaps the best way to deal with the issue at present is to recognize that addictive behaviors are similar to other behaviors, driven by similar mechanisms, and specific vulnerabilities may be present for different individuals. By treating each individual on a case-by-case basis, the different theories that attempt to uncover global factors for addiction could all be utilized to assess what the driving force for addictive behavior is individually, and subsequently, for assigning appropriate treatment. For example, if an individual is using drugs to avoid the discomfort of withdrawal, then medications to attenuate withdrawal symptoms, may be an good starting point. As another example, if a person is impulsive, the immediate reinforcing effects of drugs or alcohol may be chosen over more long-term rewards associated with less substance use. Both medication and behavioral treatments have been effective in reducing impulsiveness, which should reduce substance use. Other theories that attempt to explain addictive behaviors include noncompensable dopamine (cues associated with drugs increase in value with continued drug use), compulsivity (abnormal habit-based drug seeking), and incentive salience (drug cues cause craving, driving drug seeking), among others. I would argue that none of these theories completely explains substance dependence broadly, but these theories may explain excessive substance use in specific individuals, such that the approach to treatment would differ for each individual. Perhaps the most damaging of ideas is that addiction is the result of moral failing, and while scientists have rejected this idea for decades, the public perception of addiction as a moral failing persists. Many may very well deny this belief, but statistics from the Bureau of Justice seem to suggest that individuals with drug problems need to be punished rather than helped. 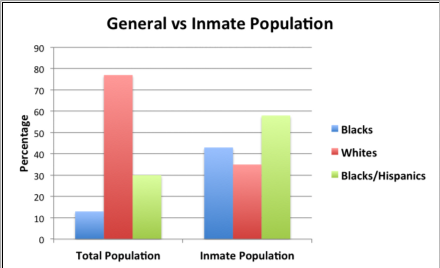 Even more troubling is the implication of prejudice in our criminal justice system towards African Americans, leading to the incarceration of more African Americans compared to whites, even when the evidence does not support that this needs to be the case, as was recently discovered in the investigation in Ferguson following the death of Michael Brown. African Americans represent almost half of the inmates in prisons and jails while only representing a 13% of the general population. Even though whites use drugs more than African Americans, the rate at which African Americans are sent to prison for drug offenses is 10 times that of whites. I think the larger issue is our society’s perception of racial minorities and our society’s perception of what racial minorities are capable of. We seem to think that minorities are more capable of violence and/or problem drug use. Dr. Carl Hart, argues that problem drug use in impoverished neighborhoods are due to a lack of resources that are present in middle or upper class neighborhoods, meaning that drug use might resemble addiction, when it is really a consequence of limited alternative reinforcers. Minorities are already at a disadvantage when considered for jobs, and as a consequence African Americans have 50% more unemployment. The gap in employment is not bridged even when factoring in higher education. 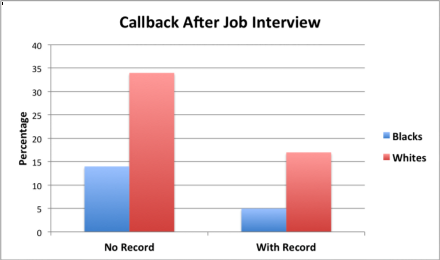 The divide is even more striking when African Americans applying for a job have a criminal history, with only 5% receiving a call back after a job interview. It appears that we don’t consider the criminal justice system as an opportunity for rehabilitation, as we should; rather, we consider it well-deserved punishment. And, if you think our criminal justice system is rehabilitating individuals, then you are wrong, because roughly 66% of inmates re-offend. Furthermore, those with criminal backgrounds are haunted by their crimes for far too long. We view it as the fault of the person who engaged in criminal activity, and we as a society have little empathy for criminals, especially minorities. Many of us, myself included, are born into fortunate circumstances, with plenty of safety nets, and we rarely consider the difficulties of being born into less-fortunate circumstances, where opportunities are not as readily available. We say that these individuals just need to try harder, because the American Dream is, supposedly, attainable by all. After all, it says so in the constitution, right? By the way, didn’t we fight a war over this? It seems that we are not free of our racist past. Even at a subtle level, seemingly well-intentioned people tend to exhibit an implicit racial bias. Alas, the road to true equality is a long one. The numbers in the prison systems speak for themselves, but one thing we can start doing is to cease charging individuals who commit non-violent drug offenses with more serious crimes, especially if the person is a problem drug user. We can start by recognizing that drug-dependent individuals who commit crimes need help not additional burden. If we can manage to reform our own perception to be one of compassion, then we might begin to reform our criminal justice system. For drug-use disorders, science has discovered several evidence-based treatments, but these are not widely available anywhere. According to Nora Volkow, director of the National Institute on Drug Abuse, and prominent addiction researcher, the criminal justice system is in a unique position to implement evidence-based practices. Many might disagree, stating that a person has to be motivated for treatment, but contrary to popular opinion, a person does not have to want to get better for treatment to be effective. There are effective means of helping someone with addiction, but our society relies on outdated ideas, such as 12-step programs, because they are free and popular and propagated by the media. Our society relies on this outdated philosophy to help our loved ones, and if the person does not get better, according to 12-step philosophy, it is the person’s fault, and we, as a society, can wipe our hands clean of the problem and walk away. This is not helping. This is causing more problems, and worse, it is denying the existence of more effective treatment, grounded in evidence. Our criminal justice system is failing. Most inmates re-offend. One major reason for this is that almost half of the individuals committing crimes are considered substance-dependent and are not receiving the help they need. The science is in, and now it is up to the institutions dedicated to helping people to catch up to the science. It can start in the criminal justice system. This system could invest in effective evidence-based treatments for substance dependence, thereby reducing recidivism and maybe actually helping a few people in the process.